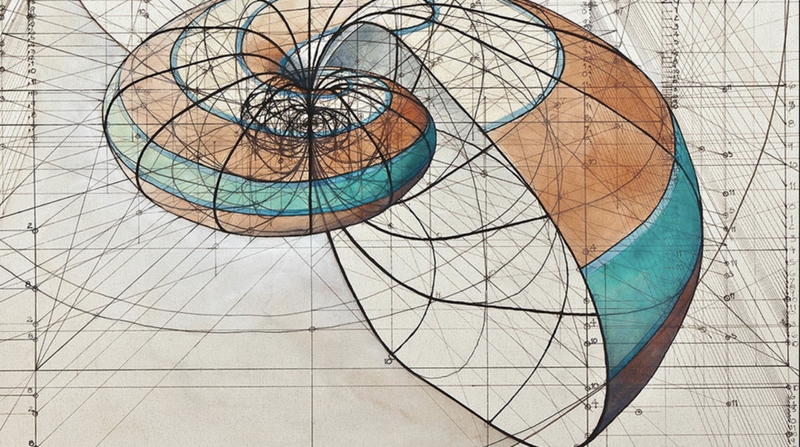 A measurable formula of beauty was first identified by the ancient Greeks as 1:1.61803398875 known as the ‘golden ratio’ which can be found throughout the architecture of our world. Also known as ‘Fibonacci scales’, examples of the golden ratio are found beautifully in the form of the nautilus shell, flowers, the spirals of galaxies, and even all throughout our bodies and faces. The perfect eye brow breaks at the arch, for example, at approximately 1:1.618. A perfect symbolic representation of the golden ratio with respect to cosmetics and beauty can be found in the ‘eye’ of a peacock feather. The peacock represents immortality and resurrection as the ancients believed that its flesh did not decay. Peacock motifs can therefore be found in association with Christian iconography as well as many other depictions of restored or extended life. But although there are classic measurements to beauty, we as individuals express very diverse varieties of physical beauty. For example, the ‘perfect eyebrow’ may need to be tailored in order to accommodate a facial morphology. It takes an artistic eye and skill to apply those measurements respective of each person’s unique features in such a way to achieve balance and beauty. Please view the gallery to find examples of Ashley’s work and the variety of feature styles designed for a variety of individuals here. If you’re researching permanent makeup artists and microblading in Seattle, I would like you feel confident about the person you select as your service provider. First of all, let me congratulate you for doing research. Many unsuspecting people assume that anyone offering this service must be qualified to do so and may not encounter this list before it’s too late. To help you in your search for a Seattle microblading professional, I’ve put together a short checklist of questions you should be able to answer by looking at the website of the service provider. First, you should look for the CPCP Certificate. 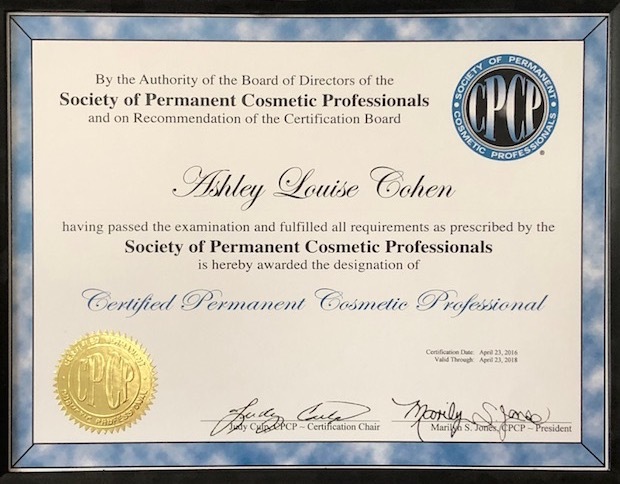 This certification is issued by the Society of Permanent Cosmetic Professionals, (SPCP), which holds its members to the highest professional and ethical standards of any permanent makeup organization, worldwide. The presence of the CPCP emblem on the website of your provider will assure you that he or she has completed more than 150 hours of training, maintains a minimum 12 hours of continuing education bi-annually, attends a 6 hour blood borne pathogens class in person bi-annually, and has passed a rigorous test only given at conferences and conventions where members learn from the top in our industry. That’s a mouthful, but these points are crucial to understanding how important the CPCP certification is. Also, if your provider displays this certification, you can skip the next three items on the list. In the absence of a CPCP certificate, it is VERY IMPORTANT for you to find out how many hours of training the provider has had. It is truly appalling that a license for operation is issued to people who have had only two days of training but that is the current Washington State standard. Even though progress has been made in legalizing the minimum requirement of 150 hours, we are not there yet. I have inquired into just how many licenses have issued in the last two years but those numbers were unavailable. I believe it’s a LOT. Just remember, the posted license to operate is not a guarantee of qualification to work on your face and these people will be grandfathered into any upcoming changes to the law. Seattle microbiading providers are in almost every salon in town but far too many haven’t had any training in permanent makeup. See how up to date your provider is with industry standards by inquiring about how much continuing education, (CE), they have had in the last two years. Artists can be proud of a long career in their trade but our industry has come a long way in the last five years alone. People who are serious about their craft invest heavily in learning from teachers who have the latest innovations in techniques and knowledge about the art and science of this extremely unique, paramedical art medium. Check to see if your provider has actually attended a blood borne pathogens class in person. Washington State require licensees to take a course in blood borne pathogens annually but this may be achieved by doing an online course. In-person classes however, are the gold standard when it comes to absorption of material and the ability to have dialogue with others on the topic of workplace and practice safety. Cleanliness in the workspace is a good indication the provider actually follows through with the standard procedures which OSHA requires in order to ensure public safety so be sure to check the area where procedures take place. If it doesn’t look clean, then leave. Look at examples of their work. A provider should have a gallery of images that reflect their quality of work including pictures of healed tattoos. Achieving beautiful results is extremely challenging and requires a great deal of knowledge, skill, and talent. Does the provider have talent? You may want to know that before trusting your face to someone. I hope this helps you with your search for a qualified microblading professional or permanent makeup artist in Seattle or anywhere. I’d love to hear from you about whether or not this has been helpful to you and in what way I can be of more service. Have you been seeing jaw dropping images of the new realistic eyebrow tattoos created by a technique called ‘microblading’, or microstroking’? I’ve been following this trend closely over the last two years and am seeing more and more of it presented in social media groups I belong to. These realistic, permanent makeup eyebrow tattoos, when done by a skilled technician and artist, are truly incredible to behold. Much of this is being done out of the country but It is my belief that more and more people will want them here in the US so, I am now adding micro stroke eyebrow permanent makeup to my service menu. As an artist who understands this medium of micro pigmentation after spending FOUR fabulously busy years in the business, I see a very bright future in the new technique of micro stroke eyebrow permanent makeup. What needs to be well understood is that these micro strokes are extremely fragile and will need to be touched up on an annual basis or less. This is not far from the experience I’m having with my tattooed hair stroke clients in the way that I apply, (or implant), the pigment as realistically as possible. When you consider that you probably spend $700.00 annually on pedicures and manicures however, the price of maintaining one of your most important features, YOUR EYEBROWS, pales in comparison. Stay tuned as I reveal my first attempts on inanimate practice pads, and soon enough; images of this exciting new technique with my real life clients! Always remember, you can’t change the world, but you can look beautiful, feel great, and change YOUR world!